Written by Dr. Jane Goodall, D.B.E., Founder of the Jane Goodall Institute and UN Messenger of Peace and Azzedine Downes, President and CEO of the International Fund for Animal Welfare. The heartbreaking news of the death of Harambe, a popular western lowland gorilla at the Cincinnati Zoo, who was killed to protect a child who had fallen into his enclosure, has gripped the world and left many people questioning whether the right action was taken, and why gorillas and other animals are kept in zoos at all. We received dozens of calls from media outlets asking for comment. We understand the nature of breaking news and social media is to tend to the short, simple and often inflammatory statement, but we felt that everyone involved in this situation — the injured child and frightened parent, the keepers and administrators at the zoo, and Harambe himself deserved time for grieving, reflection and careful reasoning about the incident. So we joined forces to address some of these complex questions and issues in a more considered way. What follows are our responses to some of the frequently asked questions. Q: Dr. Goodall, you are known as one of the world’s foremost experts on primates. Therefore, many people are interested in knowing what you think of Harambe’s behavior with the boy. Can you guess what Harambe was thinking, or interpret his behavior? Dr. Goodall: The only thing that can be known from the video is that a 450lb animal had hold of a small child. Harambe could have hurt the child even without intending to cause harm. It would be difficult for even people familiar with Harambe himself, researchers or keepers who may have spent hours with Harambe, to ascertain his intentions from a distance in as short a time as it would take to do irreparable harm. It certainly appeared at times that he was being gentle, but he was nervous and agitated by the unexpected arrival of the child and the shouting of the people watching. Q: Did the zoo make the right decision? Could they have tranquilized Harambe? Mr. Downes: Based on what Jane is saying about not being able to ascertain Harambe’s intent and the likelihood of even accidental death or injury to the child, I don’t think the zoo had any other choice. That is the sad fact about keeping wild animals in captivity. There is always a potential risk to public safety and to the animal. Dr. Goodall: I agree. And also it takes time for a tranquilizing dart to take effect. It was awful for the child, the parents, Harambe, the zoo, the keepers and the public. But when people come into contact with wild animals, life and death decisions sometimes have to be made. Q: What can be done to prevent something like this from happening again? Dr. Goodall: There is never a 100% accident proof way of ensuring a wild animal kept in captivity will not pose a threat to people. In the United States, there is the Association of Zoo and Aquariums (AZA), and globally there is the World Association of Zoos and Aquariums (WAZA) — organizations that develop and promote the adoption of the high standards of public safety and animal welfare. CNN has reported that the Cincinnati zoo has enhanced its measures to keep people out of the enclosure and the AZA and Unites States Department of Agriculture are conducting investigations to be sure that safety measures are up to standard. However, we will never be able to be 100% sure that people and wildlife won’t be injured when they are in such close proximity. Mr. Downes: The Harambe story has highlighted the very rare occurrence of a person being injured at an AZA accredited zoo, but a far more common occurrence here in the US is a person being terribly injured or killed by a wild animal kept in private ownership, such as tigers, lions, and bears being kept at roadside attractions, backyards and basements. IFAW estimates there may be as many as 10,000 big cats in private ownership. Individual owners and local public safety officials are not prepared to deal with emergencies when these animals escape. IFAW focuses on passing legislation to address this larger and more dangerous issue. Dr. Goodall: Yes, I agree. The same is true for captive chimpanzees in private ownership. Q: Because of this story, many people who hate zoos, are vilifying them and those who love zoos are defending them. Many people are wondering about your thoughts on zoos. Can you tell us what you think? Dr. Goodall: First of all, it is important for people to know that not all institutions that call themselves zoos or sanctuaries maintain anywhere near the same kind of standards of care. If an institution is maintaining a very high level of care for its animals, giving them lots of room, a good social group and a great deal of enrichment, then I believe that many species of animals can have a reasonable — even a good — life. I know many people who first came to care about animals and learned about the need for conservation when they visited a zoo. Zoos reach a large audience of people with their conservation message although often this could be improved, and many zoos are involved in the conservation of animals in the wild — as all zoos should be. That said, we are learning more and more about animals, their familial and community relationships and their inner lives. As we learn more about the intelligence and emotional lives of the other animals with whom we share the world, it becomes more difficult to justify keeping them in captivity. Through the Internet, books, photos, film and TV, more and more people can “experience” up-close views of wildlife without the animals ever leaving their free and natural habitat. And for some animals like dolphins and whales, it is the only ethical way. Yet I do believe that zoos with the highest standards of care can play an important role. For a child – or even an adult – being in the presence of a living, breathing animal, knowing the way it smells, looking into his or her eyes, and above all sensing its ‘being-ness’ can be a life-changing experience. Moreover, we have to realize that life in the wild, in many parts of the world today, is not providing animals with a good life. One day in the future we may be able to ensure adequate protection of wild habitats for all animals – but that seems a long way off. 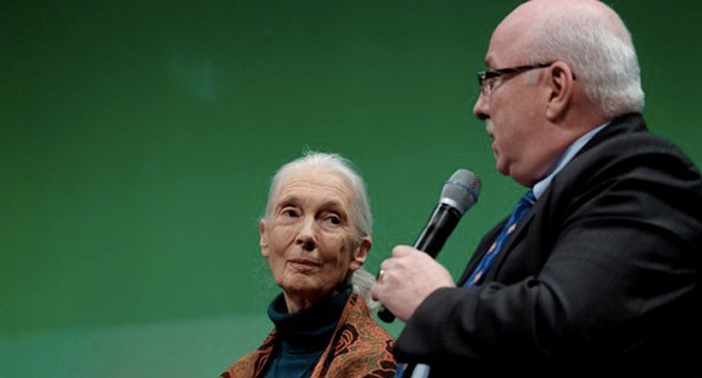 Mr. Downes: I want to reinforce Dr. Goodall’s point that there is a wide spectrum of quality among institutions that call themselves zoos or sanctuaries. And also, I’d like to point out that people’s attitudes toward zoos are constantly evolving. As our knowledge of animals and their needs increases so does the quality of care we can provide. The top AZA accredited zoos that we see today are nothing like the rows of animals in barren cages one would have seen in the early 19th century menageries. IFAW works with partners in the zoo community whenever we have an opportunity to work on joint goals—most often including conservation and public education. We do believe that wild animals belong in the wild, and we’d like to keep society moving more and more in that direction. However, we acknowledge that there are many reasons why animals may be kept in captivity, including public education, or the fact that the animal cannot survive in the wild on its own. The critical point then is to ensure that each animal has its individual welfare needs met. It is important for people to be aware, simply keeping an endangered animal in a zoo is not conservation, the zoo must engage the public in meaningful education around the plight of animals in the wild, and contribute financially to meaningful conservation projects around the world. Simply “storing” specimens for a future without animals in the wild is defeatist and paints a grim picture of a future without hope. Dr. Goodall bases so much of her work on unlocking hope in our youth and that includes hope for animals living in captivity. Q: Harambe’s story has also brought gorilla and great ape conservation to the forefront. Can you tell us why great apes are threatened in the first place? Dr. Goodall: Fragmentation and degradation of habitat along with illegal hunting for the bushmeat trade (the commercial hunting of wildlife for food) are two of the most significant threats to chimpanzees in the wild. Also because of the demand for bushmeat, hunters will kill mothers with infants – which is totally unsustainable. And on top of that there is a demand for chimpanzee infants for the illegal exotic pet and entertainment trade. This means that even those who do not hunt for bushmeat may kill mothers simply to steal their babies. Q: People are wondering how they can help join the fight to protect gorillas and great apes. What are some ways you recommend to people who want to help? Dr. Goodall: JGI works to protect chimpanzees and other primates by protecting great ape habitat across the Congo Basin, Uganda, Tanzania, Rwanda, Burundi and Senegal through reducing deforestation and by encouraging the linking of fragmented forests by means of ‘corridors’ of suitable habitat to promote connections with other populations and permit genetic exchange. Much of this work is done through community-centered conservation where local people lead decision-making about the use of their land. We also maintain sanctuaries, support law enforcement efforts to reduce illegal trafficking and provide educational materials about wildlife and the need to protect it. In particular we work with teachers and children through our Roots & Shoots program. Without sanctuaries, law enforcement officers would be unable to confiscate chimpanzees from great ape traffickers or hunters as there would be no place to take them. Without education programs, community members would not realize that they should alert law enforcement agencies about poachers or that their activities were wrong. JGI is now seeing an increase in arrests and prosecutions as a result of greater application of the law, and a greater understanding of the issues, but it is imperative for this work to continue. It is equally important to provide local people with alternative ways of earning an income without relying on illegal hunting or destroying the forest to make money or grow crops. Mr. Downes: I think the simplest way to say it is we need to protect wildlife habitats and shutdown wildlife crime. Like the Jane Goodall Institute, IFAW works to protect habitats at a landscape level, which includes securing protected areas, integrating wildlife migration corridors through more developed areas, reducing human-wildlife conflict, and disrupting wildlife crime. We need to attack the problem on all these fronts if we want to make a real difference before it’s too late. Dr. Goodall: For people around the world who want to help, the first and most important thing to do is understand that each and every day every one of us makes an impact, and it’s up to us to decide what kind of impact we want to make. We are all interconnected with each other and with the natural world, and when we ask ourselves how our decisions will affect others, human or animal, and choose to make the lightest environmental footprint possible, we can collectively make a huge difference. We must also understand that these issues are complex. It’s up to each one of us to learn as much as we can about the threats to great apes, and about the work of organizations like IFAW and JGI that are working with local communities on the ground to protect and conserve the great apes and other wildlife. People can learn more about Dr. Jane Goodall and the Jane Goodall Institute at www.janegoodall.org and Azzedine Downes and the International Fund for Animal Welfare at www.ifaw.org. Previous ArticleLess meat, healthier environment? I have known of Dr. Goodall for years and her amazing works and love for animals! I too remember vividly when that precious Gorilla, Harambe, was killed b/c the child got into his den. It’s criminal that the Negligence of the parents/guardians in NOT watching the child lead to this gorilla’s untimely demise. I was heartbroken! Thank you Dr. Goodall for all your tremendous works and love for the animal kingdom, and particularly the majestic, intelligent gorillas!!!! Thank God for Dr. Goodall!! I truly admire her and her great Work!! I am also heartbroken with the killing of Harambe, as I also love all animals!! I truly believe the Zoo had other better choices, but unfortunately the poor gorilla had to pay with his life!! I PLEAD to all parents to please stay with small children at all times especially when there is Danger near!! When visiting a Zoo especially please stay with your Children, who knows what kind of trouble they can get into!! Sorry Harambe had to pay with his precious life!!! !